Here at ERGC we take great pride and care in what we do. We feel that you as our customer should be treated with the utmost respect. After all it is YOUR hard earned money and we appreciate that you would consider spending it on our products. We will take the time to help you choose the rifle that is right for you. Quality products, customer service and satisfaction are our number one priority. Our rifles are hand built from quality materials and workmanship and carry a lifetime warranty on all metal parts. Our products are manufactured on state of the art CNC machinery to give exacting tolerances needed for the accurate rifle that you desire. Here at ERGC it isn't about quantity, it's about quality. 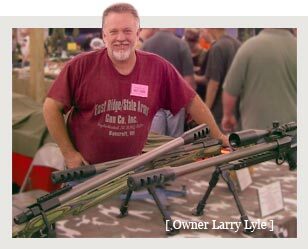 We desire to make the purchase of your .50 BMG rifle a pleasurable and exciting experience. Give us a call and see what we can do for you! 715.366.2006 or send us a message.